The Housekeepers Association of Southern Africa (H.A.S.A.) is an association which aims to educate, train and develop Housekeepers in all industries. H.A.S.A believes that one of the keys to running a successful operation is by networking and sharing ideas with other housekeepers in the industry and suppliers. Our primary goal is to empower housekeepers in the industry by means of training, education & development. To promote and facilitate the development of housekeepers and by encouraging appropriate stakeholder networks. 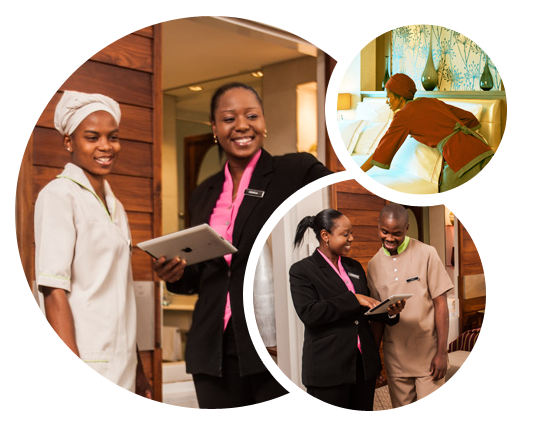 Our vision is to ensure the professionalising of the housekeeping industry in South Africa. At HASA we strive to portray values such as accountability, integrity, leadership, people-centred and passion . HASA has a variety of members including hotels, bed & breakfasts, game lodges and suppliers to the hospitality industry. Covering a large range of products and services, our members are a huge part of the Housekeepers Association, supporting our events, sponsoring product and assisting us in providing benefits to our membership base. Their membership fees also provide valuable support to the running costs of the Association, as we are a non-profit organisation. Our objective is to assist the Housekeeping industry in training, educating and developing the Housekeepers of the future. We hope that this will solve the current shortage of professional Housekeepers in South Africa and across our borders. Are you an employee in the housekeeping industry that wishes to enhance your skills? View our events calendar to see when our next training session is scheduled for in your area. The colour white resembles purity, cleanliness, freshness and comfort. Towels should be soft and fluffy; you must feel like cuddling them when you get out of that steaming shower. Wishing you the best year yet – Ke Nako – it is time!